Valkenswaard United have taken the fight to rivals London Knights, securing pole position for tomorrow's GCL Berlin showdown. With United just behind the Knights on the overall ranking, every fence will count as the two teams tussle at the top of leaderboard. With just five events left, both teams have set their sights on the Championship finals in Doha, and qualifying for the GCL Super Cup at the GC Playoffs in Prague this December. Under blue clear skies in Germany’s capital city, the formidable duo of Marcus Ehning and Alberto Zorzi pulled out all the stops with top horses Fair Light van T Heike and Cornado NRW to deliver the fastest double clear of the day, just ahead of St Tropez Pirates’ of Edwina Tops-Alexander and Pieter Devos, and home city team Berlin Eagles’ Ludger Beerbaum and Christian Kukuk took a popular third. Rome Gladiators’ duo of Lorenzo de Luca and Constant Van Paesschen were the fourth and final team to jump double clear, meaning tomorrow’s showdown promises to be an exciting race to the wire, with every pole counting. German course designer Frank Rothenberger put together a flowing course, suited to maximise the space in the uniquely shaped oval arena. 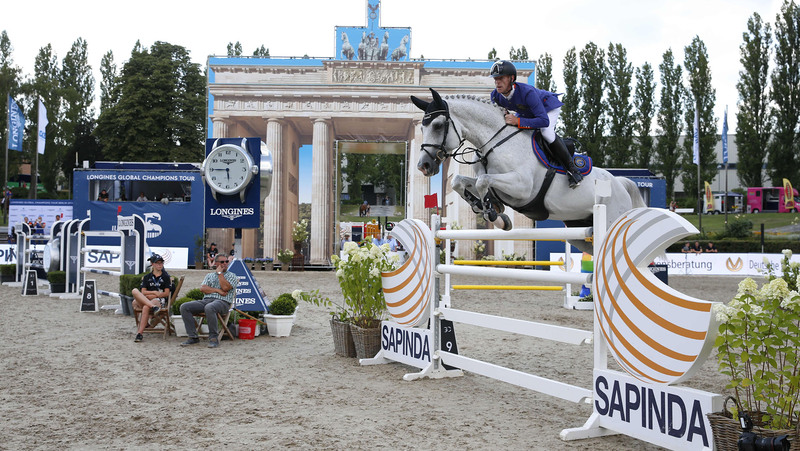 A Sapinda vertical, set on a tight turn inside the IDEE Coffee fence for those who dared it, caught out a few, and the 1.50m course offered up plenty of opportunity for those looking to take a chance at the time allowed of 76s. A light Longines plank, a short striding treble set across the diagonal and a wide DKB blue double also posed different challenges, but no particular fence proved to be the troublemaker in particular. All eyes were on London Knights, the scarlet-emblazened team at the top of the leaderboard and flashing their leader armbands proudly. First to go Olivier Philippaerts put in a flawless round with the short striding H&M Legend of Love, setting the team up perfectly for the first double clear. But teammate Martin Fuchs took out the back rail of the Global Champions oxer with Clooney, after the grey unfolded a touch too soon, picking up four faults. Knowing that time would come into play, the Swiss rider picked up the pace with his top horse, powering around to make sure they would be in touch of a podium heading to tomorrow’s GCL Berlin final. Knight’s biggest rivals, Valkenswaard United, knew that a double clear would put the team in a strong position and kick-start their campaign to keep the title dream alive. Alberto Zorzi fielded the way with Fair Light van T Heike, putting in a brilliant clear before being backed up by Marcus Ehning and Cornado NRW - the duo the first to pull out a double clear and with a fast combined time of 142.38s. Home city team Berlin Eagles entered the arena to applause from local spectators, with Christian Kukuk taking centre stage first with Cordess. The pair pulled out all the stops for a clear, passing the reins to experienced team member and mentor Ludger Beerbaum with Casello. Fans sat on the edge of their seats as the German maestro flew around the arena, piloting the hot chestnut beautifully to secure the third double clear of the day, a slightly fast time than the Gladiators. Edwina Tops-Alexander with California and Pieter Devos with Apart of the St Tropez Pirates pulled out two speedy clear rounds, shooting the team to just behind United on time, and shuffling the Eagles and Gladiators down the order. There was heartbreak for Shanghai Swans, after Daniel Deusser jumped immaculately with Cassini Bay before he was swiftly backed up by Pius Schwizer and Chidame Z who collected a single time fault for their efforts. This 1 fault slipped them behind the teams on double clear, and could prove crucial in tomorrow’s showdown. So Valkenswaard United will take pole position in tomorrow’s GCL Berlin final, with the team last to go in the order and with a clear score. The action kicks off at 11:30 local time, with expert commentary, detailed analysis and all the action streamed LIVE via GC TV and on the official FB page. Full today's results, please click here.